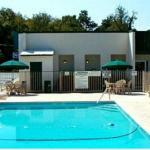 Located less than 500 metres from Interstate 26 this Cayce South Carolina motel offers an outdoor pool and free Wi-Fi access. Lexington Medical Center is 5 minutesâ?? drive away from Masters Inn. A cable TV is featured at the Masters Inn motel. A microwave and a refrigerator are included as well as air conditioning and heating. The en suite bathroom has a hairdryer. A 24-hour front desk a daily maid service and complimentary parking are available for guestsâ?? convenience at Masters Inn I-26. A vending machine and fax/photocopying facilities are also on site at the motel. Riverbanks Zoo and Garden Colonial Life Arena and Columbia city centre are each 10 minutesâ?? drive from the property. Williams-Brice Stadium is 10.5 km away. Columbia Metropolitan Airport is 4.7 km from Masters Inn.